"I don't feel the pressure," said the Russian, who will become an unrestricted free agent after the season. "One game at a time, just try to embrace it and have fun (as) the atmosphere gets more intense and the building gets more energized. It's fun to be part of." Panarin got his first goal in 13 games early in the second when Cam Atkinson batted at the puck in the neutral zone and pushed it behind the Islanders' defence. Panarin picked it up and beat Greiss on the breakaway. 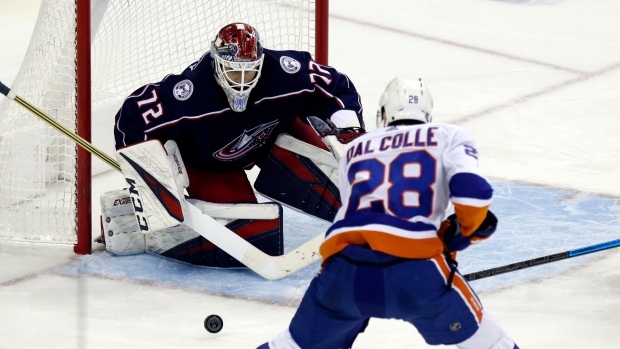 "It was a playoff game — plain and simple, that's what it was," Islanders coach Barry Trotz said. "The last two games we've played have been playoff games, and there's not a lot of room and you have to create it. If we had found the back of the net early there, it might have been a different story, but it wasn't. We were in it really until they got the third goal." NOTES: New York F Andrew Ladd suffered a knee injury in Sunday's game and will miss the rest of the season and playoffs. ... New York's Tom Kuhnhackl played in his 200th career NHL game. ... Columbus F Nick Foligno returned after missing four games to be with his family. His 22-month-old son, Hudson, was seriously ill with pneumonia. ... Greiss had stopped 80 straight shots against Columbus before Dzingel's first-period goal. ... Dzingel has a three-game points streak. ... Columbus is 30-7-2 when scoring the first goal this season. ... Columbus D Scott Harrington missed a second game with an injury.